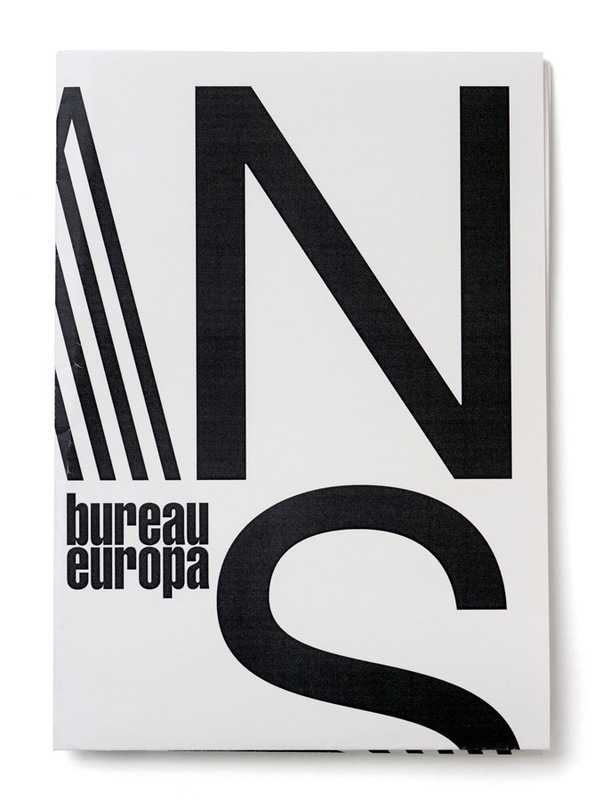 Since 2007, we've been responsible for the graphic identity of the Maastricht-based architecture institute NAi Maastricht, which in 2009 changed its name to NAiM / Bureau Europa. 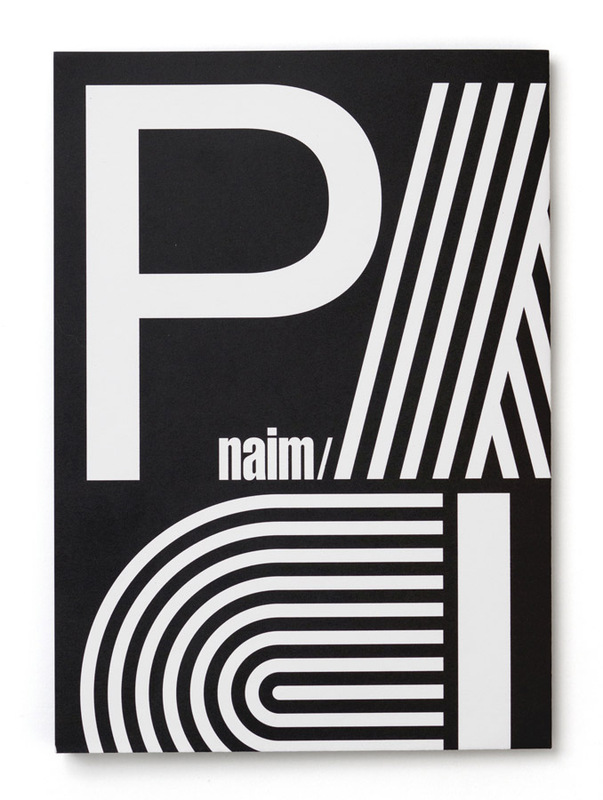 (In 2013, the institute even dropped the NAiM-part, and is currently simply known as Bureau Europa). 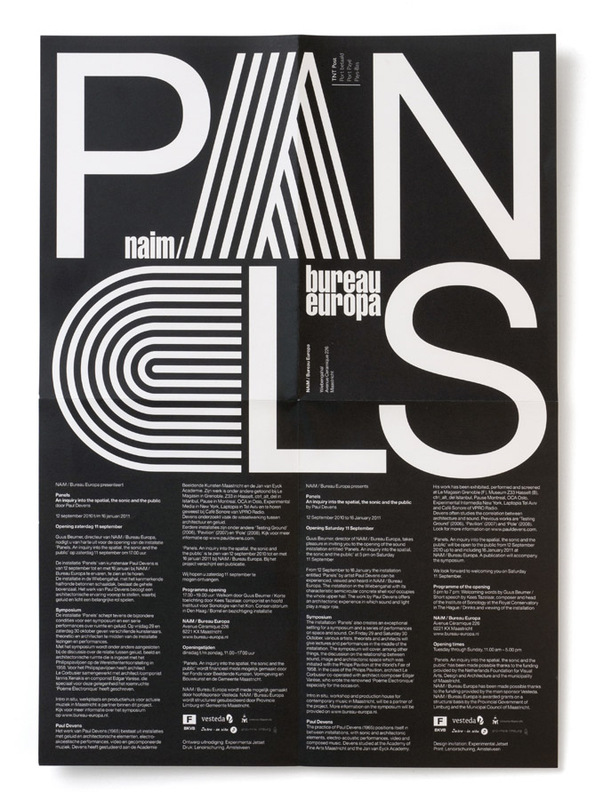 'Panels' was a site-specific installation, created especially for NAiM / Bureau Europa by sound artist Paul Devens. 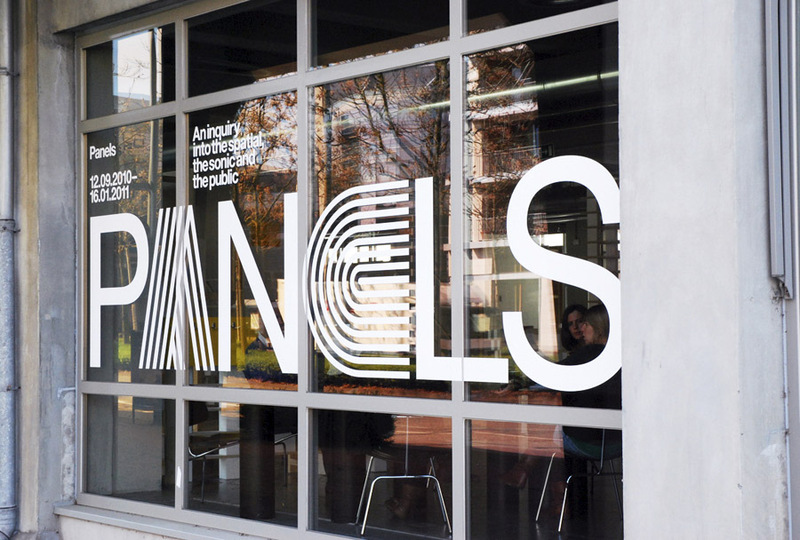 Exhibited between September 12, 2010, and January 16, 2011, 'Panels' consisted of a set of sliding arches, installed in the semi-circular concrete Wiebingahal (the hall situated at the top floor of the NAiM building). By mechanically controlling the movement of these huge arches, the sound (and light) in the hall could be manipulated. More information about the installation can be found here and here. 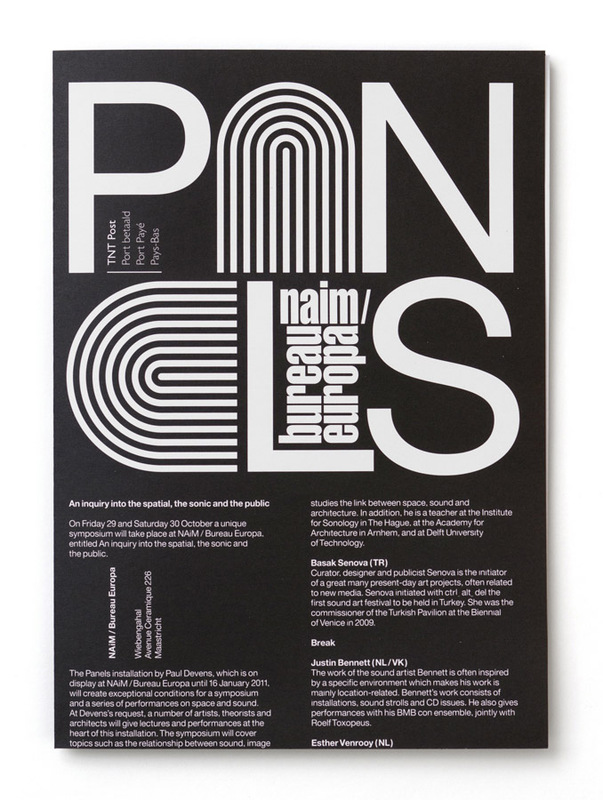 For 'Panels', we created a graphic language that we used in different ways, all throughout the exhibition. Thinking about the shapes of arches, and the idea of sonic architecture, we came up with a typology of graphic signs, which we used to replace the vowels 'A' and 'E', in the word 'PANELS'. By using these graphic signs, we tried to refer to the notion of sound, of sound-waves, and of acoustic phenomena. Everytime we used the word 'PANELS', we used a different combination of these signs, as if the vowels were constantly pronounced in a different way. We also designed a 'mini-sign-system' for the exhibition, consisting of a series of panels placed in the staircase. On these panels, we used the 'sonic signs' as arrows, leading the visitors upstairs to the Wiebingahal. 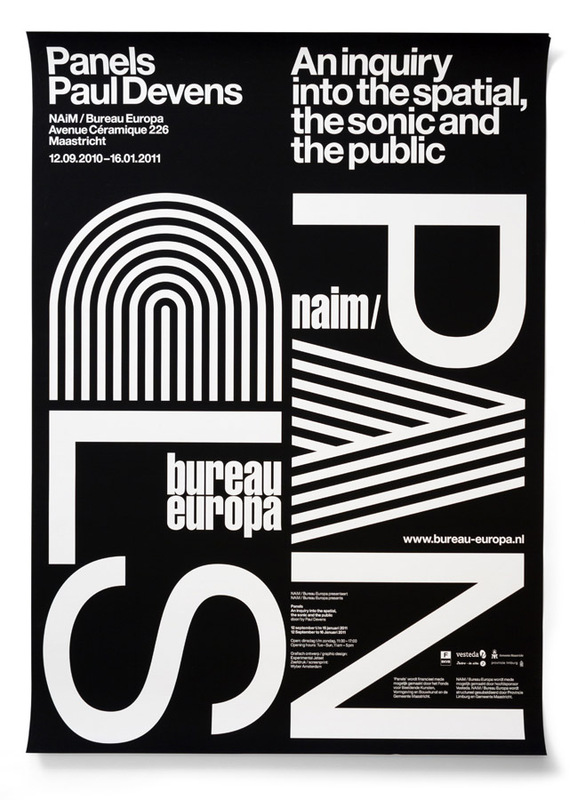 The window lettering is a regular item within the graphic identity of NAiM / Bureau Europa – whenever there is an exhibition, we quickly design some typography to be displayed in the window. Next to the invitation, the posters and the signage, we also designed a couple of hand-outs and leaflets (not shown here) that were used in the exhibition. We also designed a lot of adverts (for magazines such a The Wire), some web banners (not shown here), etc. An important part of 'Panels' was the symposium – a conference that took place on Friday 29 and Saturday 30 October, 2010, against the backdrop of the installation. 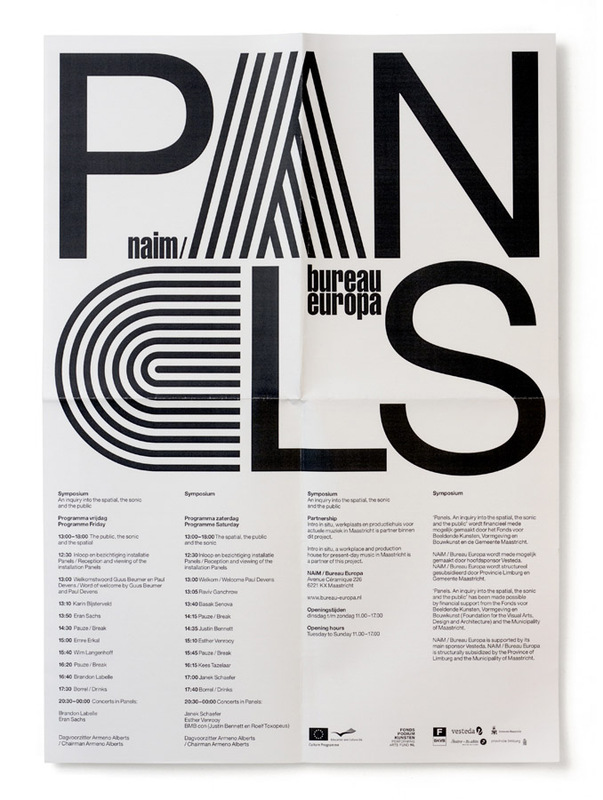 Speakers included Karin Bijsterveld, Eran Sachs, Emre Erkal, Wim Langenhoff, Brandon Labelle, Raviv Ganchrow, Basak Senova, Justin Bennett, Esther Venrooy, Kees Tazelaar and Janek Schaeffer. This symposium also featured concerts and performances. 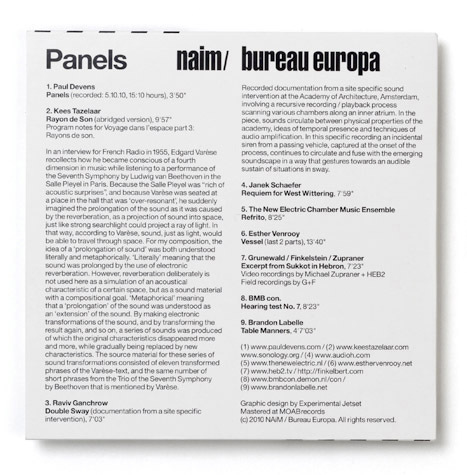 On the occasion of 'Panels', NAiM / Bureau Europa also released an audio-CD, featuring work by Paul Devens, Kees Tazelaar, Raviv Ganchrow, Janek Schaefer, The New Electronic Chamber Music Ensemble, Esther Venrooy, Grunewald/Finkelstein/Zupraner, BMB Con and Brandon Labelle. 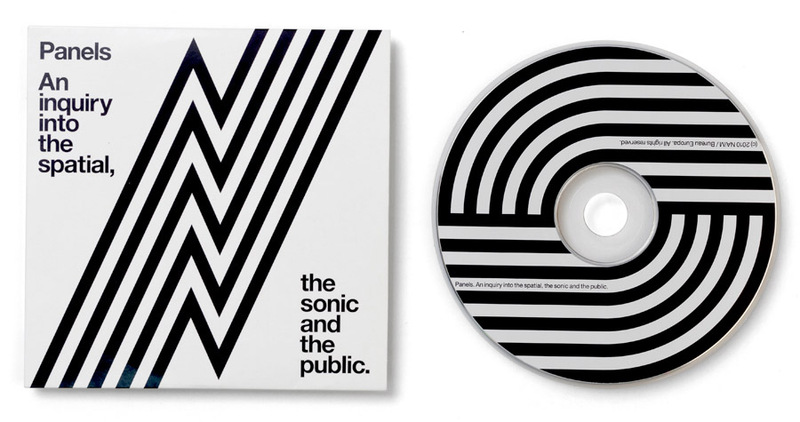 This CD was distributed during the symposium, and was later also inserted in issue 106 (November 2011) of Dutch music magazine Gonzo Circus. 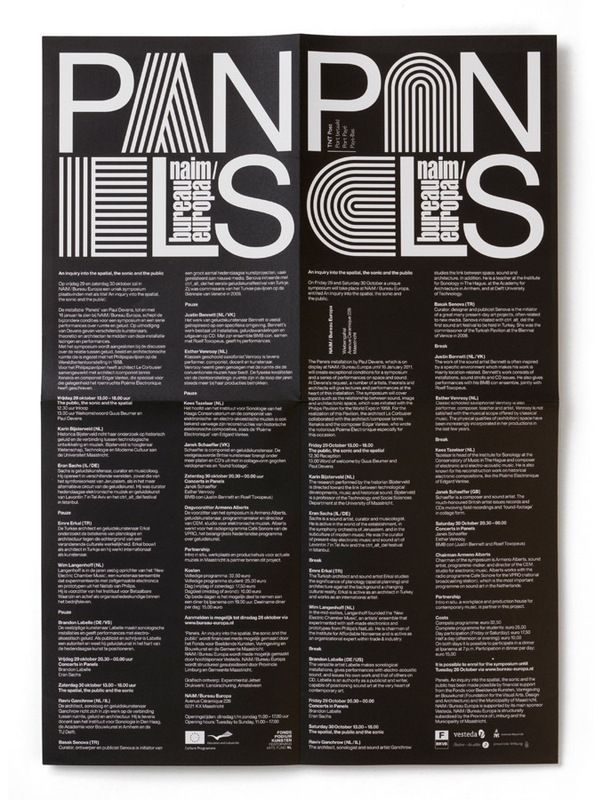 Finally, we designed a 10-page publication, which appeared as an insert in issue 105 (September 2011) of the Dutch music magazine Gonzo Circus. We haven't had the time (yet) to photograph this publication, but 'flat' digital files of these spreads can be found here.